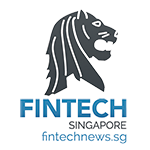 With the upcoming week long Fintech Festival organized by the Monetary Authority of Singapore (MAS), the central bank has named the 100 challenges it invites fintech startups and ventures from around the world to solve using innovative products and services. In November, MAS will organize the inaugural Singapore Fintech Festival which will bring together a series of district fintech events. As part of the Fintech Festival, MAS will also be hosting the Global Fintech Hackcelerator. Aimed at creating market-ready solutions to 100 industry problem statements, the Global Fintech Hackcelerator is inviting teams from around the world to submit their ideas and proposals. In August 2016, 20 teams will be shortlisted to join the 10-week Global Fintech Hackcelerator and present their solutions during demo day on November 15, 2016. 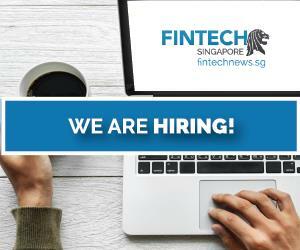 These teams will receive guidance and mentorship from industry experts, up to S$20,000 per team in cash prize, the opportunity to connect with the fintech ecosystem in Singapore, among other privileges. 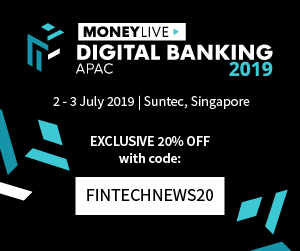 As part of the Singapore Fintech Festival, MAS will also host an award ceremony to recognize innovative fintech solutions that have been implemented in Singapore and globally. S$1 million worth of prizes will be given out to up to 10 winners from 4 categories during the MAS Fintech Awards night on November 17, 2016. 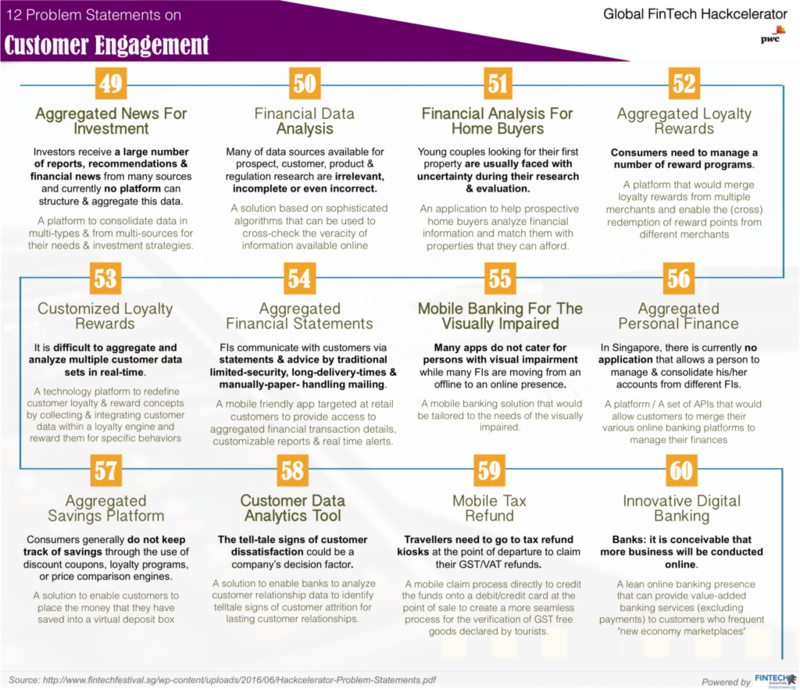 The release of the 100 tech problem statements comes simultaneously with a number of fintech initiatives the authority has announced earlier this month. On June 06, MAS released a consultation paper on proposed guidelines for a “regulatory sandbox” aimed at allowing financial institutions and non-financial players to experiment with financial technology solutions. Later during that same week, MAS announced plans to make it easier for startups and small and medium-sized enterprises to access securities-based crowdfunding in two ways. MAS has named six problem statements related to KYC and identity authentication. The authority has suggested using technologies such as APIs, distributed ledgers and biometrics for a wide and varied range of applications. This includes building a platform that facilitates digital exchange, signatures and authentication of notary documents. MAS is also looking for new innovative authentication methods and is interested in developing a central database for KYC/AML accessible by financial institutions through a secure platform. 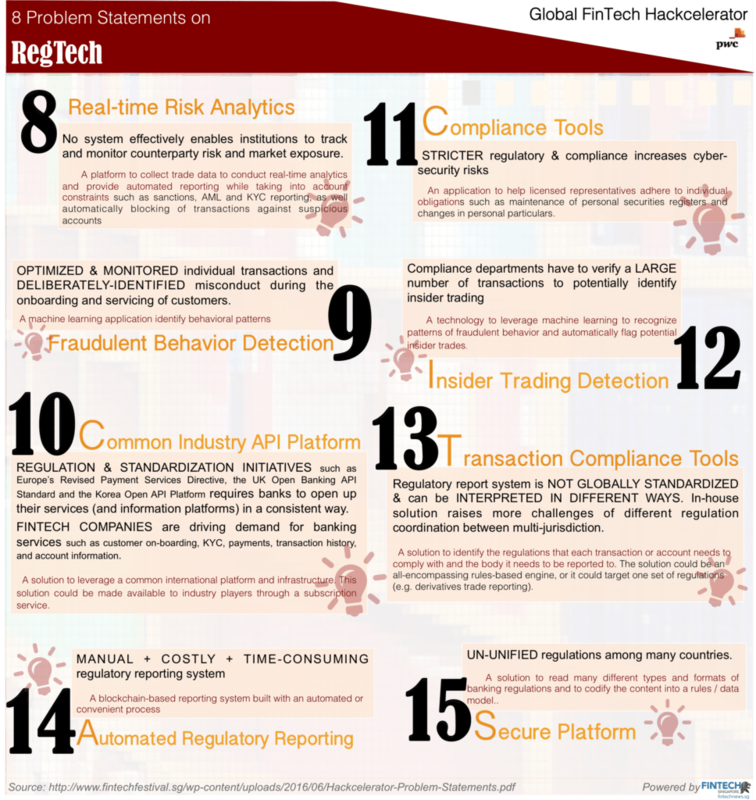 Another set of problematics is regtech. MAS is looking for use of big data, distributed ledger technology, learning machines and APIs, to provide platforms and solutions for real-time risk analytics, fraudulent behavior detection, a common industry API platform, compliance tools, insider trading detection, among others. The authority is also looking at blockchain and smart contract technology to provide greater efficiency and speed in trade finance. For instance, MAS has suggested building a digital marketplace that would include banks, insurance companies, credit agencies, market lenders and the SME sector, aimed at raising awareness on trade finance and trade credit products available to SMEs. Another idea would be to develop a smart contract solution to verify trade documents. 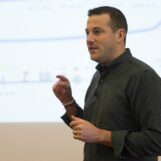 In the insurance business, MAS has suggested using APIs, blockchain technology, learning machines, big data and advanced sensors, as well as leveraging data collected by connected devices, medical record history provided by hospitals, insurers and smart health hardware providers, for “smart pricing.” The authority has also suggested building a platform that would leverage blockchain technology to automate the claims process. Smart contract technology can be used to allow for the exchange of information, eliminating the need for third party verification. 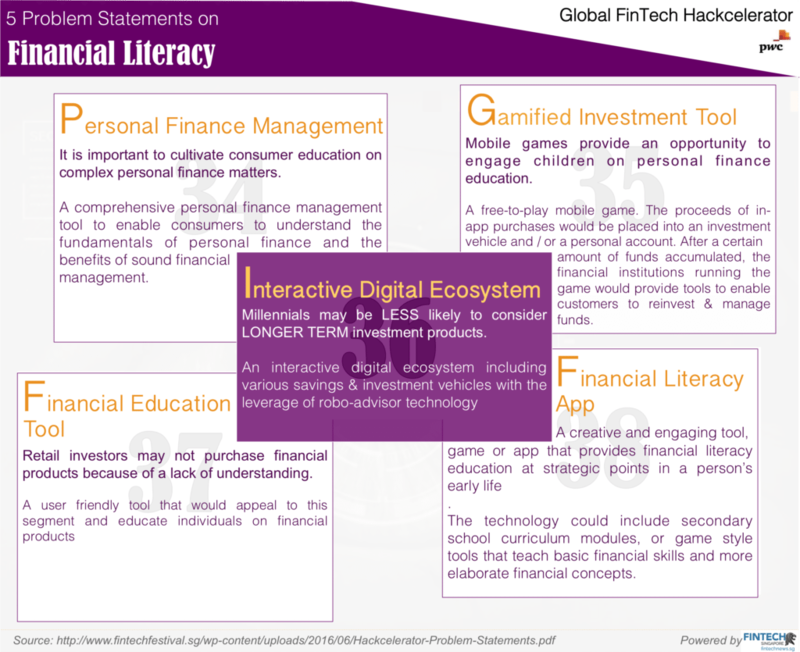 To increase financial literacy, MAS has proposed leveraging gaming and gamification, as well as learning machines, to develop user-friendly tools, interactive digital ecosystem, and apps to educate millennials and younger generations on basic financial skills. On financial inclusion and SMEs, MAS has suggested developing a solution that would leverage on existing government authentication solutions to validate the identities of migrant workers. The authority also proposed developing a full product suite for SMEs to manage their purchase orders, invoices and cash flows, as well as finding a solution to enable financial institutions to offer banking solutions to unbanked populations. On customer engagement, MAS had advised for the development of a platform that would consolidate news, information and reports that are relevant to investors. Big data and learning machines could also be used for financial data analysis. Another area it is interested in exploring is customer loyalty and rewards that would include building a platform that would merge loyalty rewards from multiple merchants and enable cross redemption of reward points. Payments innovations have been one of the main focuses of attention of MAS. The authority, which announced plans for a new peer-to-peer payments system earlier this year, has detailed other possible products and services in the payments area. These include the development of digital cheques, micropayments systems, enhanced mobile wallet tech, but also a seamless payments solutions that would leverage biometrics, linkage of authentication to unique ID accessible across all banks, as well as funds transfer via digital and mobile medium. On portfolio management, MAS is looking for a number of platforms that would benefit both businesses and end-users. One idea is a B2C2B platform that would allow automating the end-to-end ordering process for fund management and the insurance industry. 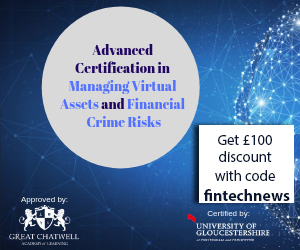 Other ideas include a solution to connect the regional exchanges to publish the indices in local Asian currencies, a real-time diagnostic tool to detect NAV calculation anomalies across a large number of portfolio, an interactive customer evaluation tool for financial advisors to assess customers’ investment profiles, and a “next-gen” robo-advisor that would leverage AI and natural language processing to provide effective trading strategies using qualitative and quantitative data. Finally, solutions that leverage blockchain technology, APIs, cloud computing and big data, could allow capital markets to become more efficient. 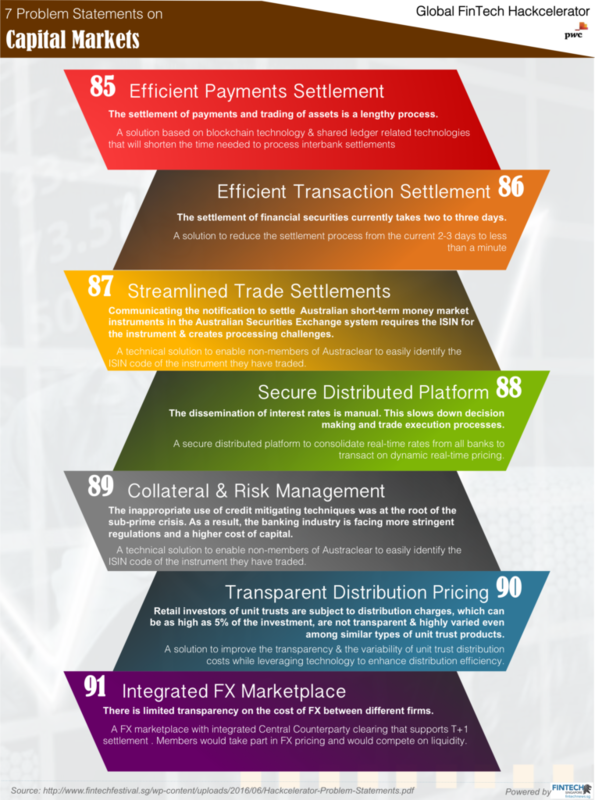 Possibilities include a platform that would provide optimal collateral and risk management capability, a solution that would improve transparency to enhance distribution pricing, and a forex marketplace with integrated Central Counterparty clearing that supports T+1 settlement. When is the deadline to submit applications for this project? Any guidelines?